Ye X, Al-Babili S, Kl�ti A, Zhang J, Lucca P, Beyer P, Potrykus I (2000) Engineering the provitamin A (beta-carotene) biosynthetic pathway into (carotenoid-free) rice endosperm. Science 287:303-305. Dawe D, Robertson R and Unnevehr L, Golden Rice: What role could it play in alleviation of Vitamin A deficiency? Food Policy 27: 541-560, 2002. Is beta-carotene safe? Are any toxic effects to be expected from Golden Rice? Beta-carotene is a natural component of many plant foods including all green vegetables and carrots, and is not known to be toxic. When intake is high the excess is stored in body fat as beta-carotene, or excreted, and only converted to vitamin A when needed by the organism. It is not possible to suffer from an overdose of beta-carotene, while the same cannot be said of straight vitamin A (Clevidence et al., 1997; Khachik et al, 1995). There are just two reports of potentially adverse health effects from the consumption of beta-carotene, and both involve dietary supplements, not food. In these studies, beta-carotene was given at high levels of vitamin A or vitamin E, respectively. One of these studies suggested, but did not prove, that beta-carotene may, in certain circumstances, be harmful to smokers. Moreover, unlike with vitamin pills, there is no danger of vitamin A toxicity, as there is no vitamin A in Golden Rice, only non-toxic carotenoid precursors that enable the human body to make vitamin A as required. The natural lipid membranes (of fatty nature) in rice seem to be enough to facilitate the absorption of vitamin A, even in diets with little or no other added oil. For many millions of people in the world, rice is not only a source of energywhich they obtain from the starch contained in the grainbut also a main source of essential lipids, in spite of the low fat content of rice grains. Clevidence BA et al., Human consumption of carotenoid-rich vegetables, in Antioxidant Methodology, pp 53-63, 1997. Khachik F et al., Lutein, lycopene, and their oxidative metabolites in chemoprevention of cancer, J Cell Biochem, Suppl 22:236-246, 1995. What guarantees the safety of Golden Rice? The Golden Rice Humanitarian Board is committed to the highest standards of safety assessment being conducted, and Golden Rice will only be made available for consumption after clearance by the relevant authorities and according to national legislation. The seeds have been donated under the licensed terms of the technology and it is for national regulatory authorities to determine the safety requirements. Syngenta, whose scientist were involved in the development of the latest Golden Rice version, believes that the seeds are entirely safe. Carotenoids are not dangerous by any definition: they are widely available in the environment and in the human diet (especially in green vegetables). There is no reasonable argument that would support any public health, human toxicological or any other adverse affect in respect of carotenoids. Indeed, carotenoids are more generally associated with imparting important health benefits. Regarding the genetic engineering step, conventional plant breeding involves the uncontrolled transfer and simultaneous random recombination of many thousands of genes between from all parents involved. Therefore, safety concerns in respect of the deliberate and controlled transfer of no more than two genes, as in this case, is unwarranted. While it is true that blindness due to micronutrient deficiency can be prevented by a better diet or by distribution of vitamin A capsules, the global VAD burden continues for the reasons described below. One current approach to reduce VAD in developing countries has been to supply pre-school children with 6-monthly oral doses of high levels of vitamin A in solution. Such programs reach only a fraction of the children in need and are not always continued, as the cost, need for education, medical staff and distribution infrastructure present significant logistic problems. Annual costs for a country the size of Nepal or Ghana are in the range of two million dollars (MOST 2004). The real challenges to solve malnutrition in the developing world are poverty, poor infrastructure, lack of education and awareness, and not the lack of existing technology. All these issues are important too, and should continue to be addressed, as they have been for many years. However, solutions to these problems appear to be as far away as ever, and the situation is deteriorating in many places. Golden Rice, in combination with other efficient approaches, could lead to a highly effective, cheap, and simple contribution to the relief of a major health problem. The combination of approaches will depend on the particularities of the region. MOST, USAID Micronutrient Program (2004) Cost analysis of the national vitamin A supplementation programs in Ghana, Nepal, and Zambia: A synthesis of three studies. Why not eat unmilled (brown) rice? The natural oil-rich outer layers of the rice grainthe bran and the aleuroneare rich in some important nutrients, including vitamin B, and yet rice is generally consumed in its milled form, i.e. with the outer layer removed. If not removed, the oils in those layers undergo natural oxidation processes and the grain becomes rancid, affecting odour and taste very rapidly, particularly in tropical and sub-tropical climates. Milling improves the long-term storability of rice without loss of taste. 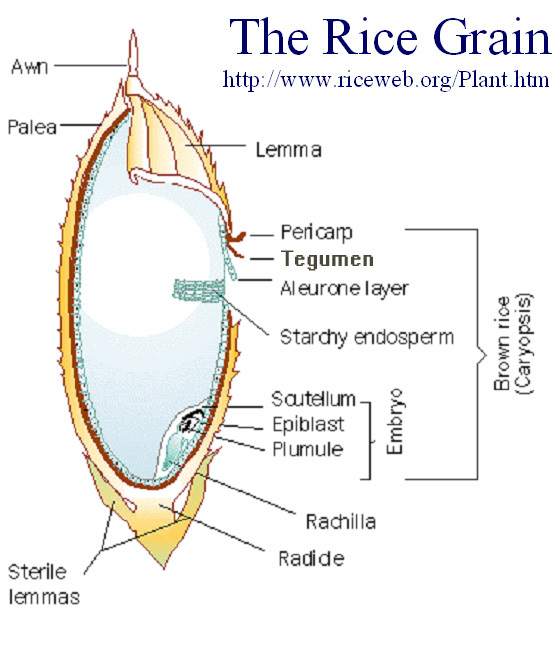 The schematic shows the most distinctive structures of a rice seed. White rice is the most commonly consumed form of rice. Golden Rice will be more like white rice in that it will be consumed as milled or polished rice, but as opposed to brown rice it will be capable of providing its health benefits even after milling. Golden Rice grains have a pleasant bright yellow or orange colour, although its appeal in rural areas remains to be investigated. Coloured rice landraces are eaten in many places, and coloured spices, like saffron, are often part of traditional cuisine. Sensitive social educational programs will be an integral part of the Golden Rice deployment. Rice varieties with superior agronomic characteristics, i.e. that grow and yield well, will be not less important for the farmers who will grow the rice. Hence the importance of introducing the trait from the genetically modified lines into varieties grown locally by farmers in VAD areas. The trait is transferred from one rice plant to the other using conventional breeding techniques. How did Syngenta become involved in the Humanitarian Golden Rice project? The inventors, Ingo Potrykus and Peter Beyer, recognized early on that while they had an important technical achievement in their hands, they required an additional set of skills and expertise to get their invention to those who needed it most. Syngenta was the inventors' preferred partner given the company's expertise in the field of carotenoids, their long standing involvement in joint EU-funded research programs, a track record of donation of such technologies to the developing world, and its long experience in regulatory affairs, licensing and intellectual property. Syngenta has produced many Golden Rice transgenic events and has identified and selected for donation those with high carotenoid levels and good agronomic characteristics. Seed from these plants and performance data were donated to the Golden Rice Humanitarian Board. In the summer of 2004 Syngenta also conducted field trials of the first three selected Golden Rice events together with two other events generated in the public sector (published by Dr Hoa and co-workers, from the Cuu Long Delta Rice Research Institute in Vietnam). The field trials, which were conducted at Louisiana State University, were undertaken as a contribution to the Humanitarian Board and the Golden Rice Project. The donation is therefore a combination of technology, a full technical dossier, licences to enabling patents, and the best transgenic lines, and reflects the work done by Syngenta and its legacy companies on behalf of their humanitarian interests over several years. More recently, additional higher expressing lines of Golden Rice (GR2) and based on new inventions, have also been donated to the Humanitarian Project (Paine et al 2005), A new version of Golden Rice with increased pro-vitamin A content. Nature Biotechnology 2005). Paine JA, Shipton CA, Chaggar S, Howells RM, Kennedy MJ, Vernon G, Wright SY, Hinchliffe E, Adams JL, Silverstone AL, Drake R (2005) A new version of Golden Rice with increased pro-vitamin A content. Nature Biotechnology 23:482-487. To whom has the donation of Golden Rice been made? The donation of the Golden Rice transgenic events was made to the Golden Rice Humanitarian Board to carry forward the project and transfer the technology to target countries. The donation of the first events was officially made on 13 October 2004. The donation was put into effect by amendments to the licence agreements to the licensee network working with the physical materials. The licences remain free, do not create any new dependencies, and are necessary to maintain good stewardship of the technology. What will happen to the donated transgenicGolden Rice lines? The donated lines have been used to select the best-suited transgenic event and for breeding purposed. The selected event has already been crossed with some major, locally preferred rice varieties to give farmers the opportunity to grow rice containing the trait without having to change their agronomic practices or cooking habits. This work will be managed by the Golden Rice Humanitarian Board and by the public institutions that are licensees in target countries. No charges will be levied for the use of the trait. IRRI plays an important role as the hub of the Golden Rice Network and also conducts part of the breeding work. What specific support does Syngenta provide to the Golden Rice Humanitarian Board? Since the inception of the Humanitarian Board, Syngenta has provided significant support in their areas of expertise, which includeregulatory affairs, biotechnology research, product development, intellectual property management, stewardship and training. 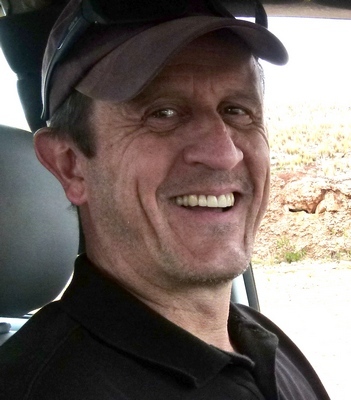 Dr Adrian Dubock (at present the Golden Rice project manager and formerly Syngenta's Head of Public-Private Partnerships, is the person who initially negotiated the agreement with the inventors, at a time when Zeneca (one of the legacy companies which formed Syngenta in 2001) had a commercial interest in nutritional enhancement of rice), is the contact person for Syngenta on the Humanitarian Board. If Syngenta has no commercial interest in Golden Rice, why then is it supporting the development work? Syngenta has no commercial interest in Golden Rice in respect of its potential use or application in developing countries. Initially was investigating a potential commercial use in developed countries, but in the meantime it does not see a commercial market for it anymore. Nevertheless. The technology has been donated by the inventors and Syngenta to the resource-poor farmers of developing countries, and further development is now the responsibility of the Humanitarian Board and public institutes, which are the licensees. Golden Rice is being introduced into publicly-owned rice varieties via national and international public sector research institutions, to be made available by government institutions free of charge to resource-poor farmers. The farmers will then be able to grow, save, consume, resow and sell the resulting rice crop into the local economy. No new dependencies will be created. This is the most significant donation that Syngenta has ever made. The potential benefits that the donation could bring are very substantial but also very difficult to evaluate (see eg Zimmermann and Qaim 2004). Previous donations by Syngenta have included smaller scale projects such as the Papaya Program in Asia, in which Syngenta and the University of Nottingham (UK) collaborated through the donation of technology to an Asian biotechnology program run by public sector research institutions in Vietnam, Thailand, Malaysia, Indonesia and the Philippines. Another example was the donation of antifungal proteins developed with the Catholic University of Leuven, Belgium, to benefit the post-harvest viability of bananas in Africa. Syngenta?s antifungal technology was donated to the International Institute for Tropical Agriculture, IITA, in Nigeria. Ciba Geigy, another legacy company of Syngenta, has previously donated Bt technology for insect control in rice for humanitarian purposes to IRRI, in the Philippines. Zimmermann R, and Qaim M (2004) Potential health benefits of Golden Rice: A Philippine case study. Food Policy 29:147-168. What is the role of the Humanitarian Board in the Golden Rice Project?. The Golden Rice Humanitarian Board provides governance to the international Golden Rice humanitarian project, which is being carried out by a network of licensees and national research insittutions. The humanitarian project is a public-private partnership created by the inventors in 2000 to assist in the development and deployment of Golden Rice. The humanitarian project is sponsored by HarvestPlus (which in turn is funded by the Bill & Melinda Gates Foundation and the World Bank), the Swiss Development and Collaboration Agency, USAID, and the Syngenta Foundation, together with local research institutes and several non-governmental organizations (NGOs) including the Rockefeller Foundation and the International Rice Research Institute (IRRI). The Golden Rice Humanitarian Board is responsible for the global development, introduction and free distribution of Golden Rice to target countries. The novel trait will be bred into locally adapted rice varieties for regional use. It is intended to introduce it into publicly owned rice varieties via national and international public-sector research institutions. It will then be made available locally, free of charge to resource-poor farmers. These farmers will be able to grow, save, consume, replant and locally sell Golden Rice. Who are the members of the Golden Rice Humanitarian Board? The initial research of Potrykus and Beyer was financially supported by the Rockefeller Foundation, together with the EU, the Swiss Federal Office for Education and Science (1996-2000), and the Swiss Federal Institute of Technology. Syngenta (formerly Zeneca) scientists contributed to the EU carotenoid research program of which Golden Rice had been a part since 1996. Syngenta supported the project by developing improved version of Golden Rice in their own laboratories. Funds have also been provided by USAID, the Syngenta Foundation, HarvestPlus, and the Bill & Melinda Gates Foundation. What is the nature of the licence agreement? Golden Rice is expected to become widely distributed through the farmers? own supply and exchange networks. The contractual arrangements will guarantee free access for farmers to the technology. Farmers can keep the seeds for future sowing. This will reinforce seed distribution in a virtuous circle. Have any restrictions been added to the agreement? Instead of a new contract being introduced, a side letter was added to the original agreement. This letter contains certain new conditions that had become necessary, because of the substantial costs of regulation and licensing. Because of the immense costs involved, the Humanitarian Board needs to make sure that just one transformation event makes it through the regulatory process. The selected and approved event can then be cross-bred with any locally preferred variety. Could the complex patent situation around Golden Rice affeect the deployment of Golden Rice? Patents are national in scope, not international. In the US a complex intellectual property situation exists around Golden Rice technology, which is not replicated in Europe or in developing countries. Analysis of the patent issues surrounding the initially invented Golden Rice has determined a far less complex position in developing countries than that previously reported by some analysts. Critics of the project originally mentioned more than 70 patents involved and potentially blocking the development of Golden Rice, a figure derived from a study conducted by the International Service for the Acquisition of Agri-Biotech Applications (Kryder et al. 2000). While the numbers are in principle correct, only 12 of these patents relate to developing countries, and all have been waived by their owners. The remaining patents do not restrict the inventors? freedom to develop the project for the benefit of developing countries. The new constructs donated to the humanitarian project do not require access to any additional third-party intellectual property. Kryder D, Kowalsi SP, Krattiger AF. 2000. 'The Intellectual and Technical Property Components of pro-Vitamin A Rice (GoldenRice): A Preliminary Freedom-To-Operate Review', ISAAA Briefs No 20. ISAAA: Ithaca, NY. 56 pp. How will the technology reach developing countries? The technology will be provided to international and national research organisations in developing countries under licence. The Humanitarian Board will provide strategic guidance in the application of the technology to locally adapted public rice varieties and the carrying out of biosafety and other assessments. The transformed seed has already been introgressed (bred) into locally widely consumed, public rice varities. When approved by the appropriate national authorities who will assess safety to man, animals, and the environment, the seed will be multiplied by conventional seed multiplication processes and distributed to resource-poor farmers for planting, harvesting, small-scale commercial activity (less than US$10,000 per annum, sale to neighbours and local markets) and consumption. The Humanitarian Board will continue to grant licences as they judge appropriate to the National Agricultural Research Centres and other public sector research institutions, in developing countries. The National Agricultural Research Centres and related breeding enterprises in each country will distribute rice to resource-poor farmers. There will be no extra-charge for the trait. It will be up to governments ultimately to ensure the free distribution to farmers. What are the levels of carotenoid in the donated materials? Syngenta has donated not only the first generation of improved Golden Rice (GR1), but also a further improved version (GR2). GR1 had four times more carotenoid than the prototype version generated by Potrykus and Beyer in 1999 (Ye et al. 2000). In the first field trials conducted in 2004, rice grains from GR1 had carotenoid levels between 4 to 8 micrograms per gram total carotenoid, GR2 went even further, producing up to 23 times more total carotenoid than in the 1999 prototype (Paine et al. 2005). Ye X, Al-Babili S, Klöti A, Zhang J, Lucca P, Beyer P, Potrykus I (2000) Engineering the provitamin A (beta-carotene) biosynthetic pathway into (carotenoid-free) rice endosperm. Science 287:303-305. How much Golden Rice is needed to combat VAD? Most people affected by VAD have a so-called sub-clinical vitamin deficiency level. As would be expected, these people ingest some provitamin or vitamin A with their foods, but blood vitamin levels are not high enough to sustain a healthy status. What is needed is a top-up of provitamin A to a healthy level. A GR2 line has been selected with provitamin A levels somewhere between the best GR1 and the best GR2 carotenoid levels obtained. This line was selected based on feeding trials that showed that provitamin A contained in such grains was extracted by the digestive system with high efficiency and were capable of fulfilling that top-up function. Regarding stability during processing, it is known that provitamin A is rather stable at high temperatures and hence losses due to cooking are low. Why are the carotenoid levels in GR1 and GR2 higher in this Golden Rice than in the version published by Potrykus and Beyer? There are several likely reasons. In both strains the gene constructs used by Syngenta were slightly different from the original construct. Whilst the two carotenoid biosynthesis genes are functionally the same, the genetic control element of one of the genes was exchanged. In the new strains the phytoene desaturase gene crtI is expressed using a seed-specific promoter rather than a constitutive promoter (i.e. active throughout the plant). This may have beneficially affected the amount of carotenoid that is accumulated in the grain. In GR2 the Narcissus phytoene synthase gene psy used in the original construct was exchanged for a maize homolog. Also, in their work Syngenta was able to generate hundreds of individual Golden Rice transformants among which the probability of finding plants with particularly high levels of carotenoid accumulation was higher. Potrykus and Beyer produced far fewer plants, as theirs was the proof-of-concept phase of the project. In addition, the rice variety used by Syngenta was different to that used previously, and this variety may be more suited to carotenoid production in the grain. The growing environment of the plants —light, water, nutrients— might also affect the amount of carotenoid accumulated in the grain. Is gene flow an issue with Golden Rice? While the chances of outcrossing to non-transgenic rice are very low (but not zero) the relevant issue is what effect the genes would have if outcrossing occurred. No selective advantage for the recipient plants would be expected from the carotenoid genes from Golden Rice, especially since practically all plants produce carotenoids and hence no new chemical compound is being introduced into the environment. Without a selective advantage the introgressed genes would be quickly diluted in the population. Research at IRRI (SS Virmani and HL Sharma) and many other studies have demonstrated that the chance of outcrossing from cultivated rice species is very low, as these varieties are essentially self-pollinating. Moreover, rice pollen is only viable for 3-5 minutes. Where this might be an issue, the likelihood of outcrossing can be reduced significantly by appropriate measures such as staggered flowering dates and by observing recommended distances to other rice fields. Why was an antibiotic resistance marker (Hygromycin) used? The inventors needed a way to recognise the presence of the desirable trait in the rice in their laboratory experiments, and used the hygromycin resistance marker gene (also called a selectable marker) as it was then available and suitable. Comprehensive studies have shown that the use of the hygormycin resistance gene would be safe to humans and the environment. Because of public perception reasons, the donated events have been constructed free of a marker gene (by co-transformation, a methodology in which two separate gene constructs are introduced concurrently, thereby allowing to breed out the selectable marker by conventional crossing) or they may have been produced using the sugar-based Positech® technology, licensed free-to-use by Syngenta. The latter is an alternative to antibiotic resistance marker genes and which utilises an innocuous non-metabolisable sugar as a selection agent. The transformation events being donated by Syngenta contain neither antibiotic nor herbicide tolerance selectable marker genes. With Positech®, Syngenta has recently presented a new selection technology for the identification of genetically modified (GM) plant cells. This system enables GM seeds to be developed without the use of antibiotic resistance markers. Transformed plant tissues are enabled to grow on a simple, otherwise non-utilizable sugar, hence positive selection. Positech has been put at the licence-free disposal of the agricultural research and development institute in Malaysia (MARDI) and the International Rice Research Institute (IRRI) in the Philippines, and is available for other humanitarian projects. 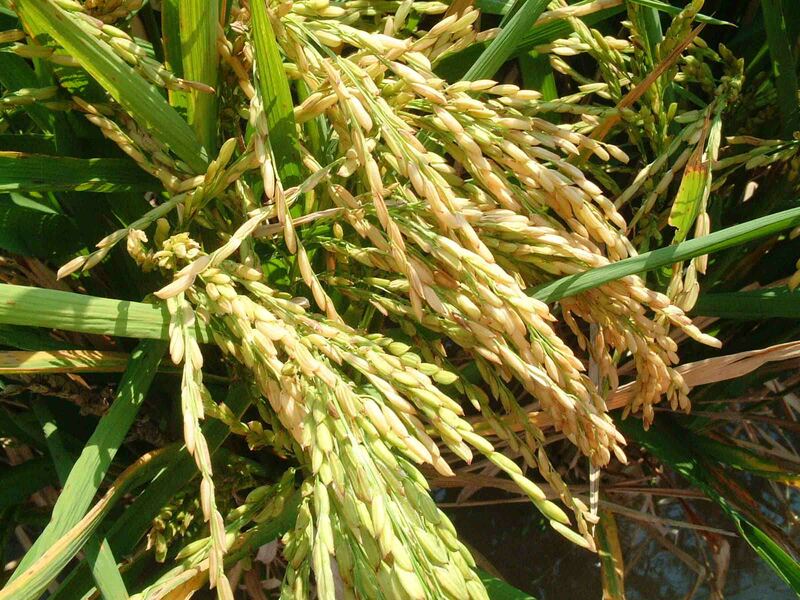 Field trials conducted since 2004 have confirmed that the provitamin A production trait does not affect agronomic performance of the rice plants. In 2005 around 100 Kg of Golden Rice was harvested for further extensive testing of the grains. Tests included human nutritional work to investigate aspects of bioavailability and bioefficacy; carotenoid retention trials in rice food preparation (i.e. how much beta-carotene is left after processing, storage and cooking) with various forms of cooking; and tasting trials with trained rice tasters. What could be the economic impact of Golden Rice in Asia? Recent studies suggest significant net economic benefits to countries from the adoption of Golden Rice. These benefits stem from the expected reduction in disease and mortality incidences from VAD, and would by far surpass any adverse economic effects from barriers to exports into countries currently unwilling to import transgenic crops. The economic benefits result from better public health as measured by DALY?s (Disability Adjusted Life Years; see Zimmerman and Qaim, 2004) as well as from increased worker productivity (Anderson et al. 2004). The value of health improvements to the Philippine economy are estimated at US$16 &endash; 88 million per year (Zimmerman and Qaim 2004). Annual net gains in Asia are estimated at US$6.3 billion (China), $2.3 bn (India), and $4.1 bn for the rest of South and South East Asia. Anderson K, Jackson LA, Pohl Nielsen C (2004) Genetically modified rice adoption: Implications for welfare and poverty alleviation. Centre for International Economic Studies. Discussion Paper No 0413. Zimmermann R and Qaim M (2004) Potential Health Benefits of Golden Rice: a Philippines Case Study, Food Policy 29:147-168. When are locally adapted Golden Rice varieties expected to be in the hands of resource-poor farmers? GR2 has been bred into locally preferred varieties in India and in the Philippines. Field trials are being conducted and the regulatory process is in full motion. With time, the selected GR2 will have been bred in locally adapted public varieties in all target countries. The transfer of the technology to local rice varieties and the necessary biosafety and efficacy testing is is ongoing and will take another two to four years to complete. Much depends on the regulatory environment of each country. When are the first health benefits of Golden Rice to be realised? The health benefits should follow shortly after the rice seeds are available for widespread cultivation and consumption. The actual timing will also	depend on the time required for regulatory clearance by the relevant authorities and seed delivery to farmers. It is hoped that by then farmers will have been informed of this development and will be prepared to adopt the "new old" seednew in colour yet still the same sort of rice they have come to know and to like over time. The positive effect on the health of their children should help spread the word. We get many mails from students expressing doubts about the significance of Golden Rice. Here is an anonymous example of how we try to address those doubts and questions.